There’s plenty of room for big families to stay together at the Skyline Inn, while allowing everyone to have their own space at the same time. After a day out exploring the sights and attractions, the hotel’s Bunk Bed Family Suites help families unwind in style and comfort. 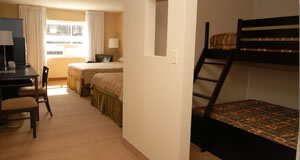 The rooms feature two queen-sized beds and a separate sleeping area with a bunk bed that has a double bunk on the bottom and a single on the top. There are also two TVs in both sleeping areas – including a 19-inch flat screen in the bunk bed area – allowing guests to relax while watching different shows. The Skyline Inn offers numerous family friendly packages that combine a stay at the hotel with great deals at area attractions and entertainment.